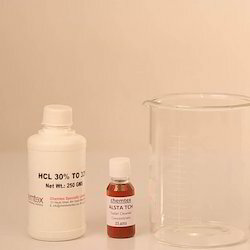 Prominent & Leading Manufacturer from Chennai, we offer acid thickener, white phenyl, make harpic type toilet cleaner at home, colin type glass cleaner concentrates, how to make lizol type floor cleaner at home and dettol type hand wash.
Chemtex Speciality Limited manufactured product Acid Thickener serves as a unique blend of hydrotropic surfactants, fragrance, odor suppressant, and dye which together becomes the best choice for formulators to easily formulate a Toilet cleaner by simply adding the Acid Thickener to dilute hydrochloric acid. It is a complete combination of all ingredients required to make a premium toilet cleaner with least hassle of formulation, inventory and logistics to the formulator. Simply take 725 ltrs of soft water in an open mouth HDPE drum, add 25 kgs of Acid Thickener with continuous stirring, after proper mixing slowly add 250 kgs of HCL (30-33%). Immediately upon addition of HCL, the solution turns blue in color and becomes viscous. Stir the solution for about 10 minutes and leave for about a day for curing and thickening. Send for packaging. 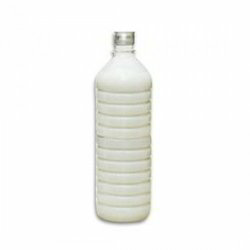 Chemtex formulated product White Phenyl Concentrate are referred to as pine oil emulsion in water. 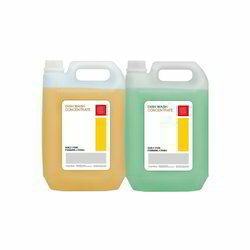 This product serves as a very good cleaner exhibiting disinfection and deodorizing properties. White phenyl finds wide spread use and acceptance as hard surface cleaner for the removal of greasy, oily and fatty soils or various non-porous hard surfaces like bathroom marbles, floors, metals, ceramics, concrete, walls, plastics, granite, cabinet, appliances etc. White Phenyl Concentrate help in the removal of dirt and grim and leave all surfaces and atmosphere pleasantly smelling. Its application areas being hospitals, clinics, veterinary clinics, homes, restaurants, factories, food establishments, offices, shops, schools, institutions, government departments etc. Toilet Cleaner Concentrates enable chemical formulators to make and resell their own toilet cleaner, with desired characteristics. It is a concentrated product that has to be further diluted with an aqueous Hydrochloric Acid solution to make it a ready-to-use toilet cleaning solution such as Harpic Toilet Cleaner. 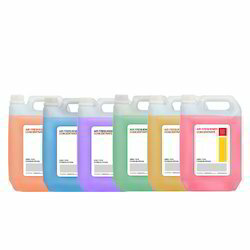 Toilet Cleaner Concentrate can be used for domestic and commercial purposes. Manufactured using finest grade materials, these Toilet Cleaner Concentrate chemicals possess high functional efficiency with longer shelf life. End use Toilet Cleaners help in effective cleaning of toilet bowls and urinals. It effectively helps in removing stains and deposits from urinals and toilet bowls. Regular use of the product even aids to hinder lime scale build-up. Glass Cleaner Concentrates enable chemical formulators to make and resell their own glass cleaner, with desired characteristics. Glass Cleaner Concentrate is a concentrated product to be diluted further with water to make a ready-to-use glass cleaner such as Colin. 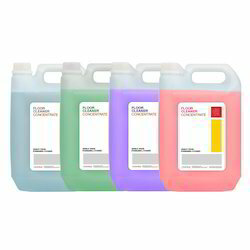 These chemicals offer effective cleaning of any kind of glass surfaces and mirror. The chemicals help in the rapid removal of oily soils and finger marks and leaves the surface clean and streak-free in one action. Floor Cleaner Concentrates enable chemical formulators to make and resell their own floor cleaner, with desired characteristics. 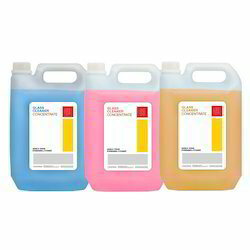 Floor Cleaner Concentrates to be diluted with water to use as a ready-to-use floor cleaner such as Lizol Floor Cleaner. Floor Cleaners are effective in cleaning of oily, greasy or soiled areas from all types of floors. They amplify the overall gloss, appearance and clarity of the floors. They are polyneric chemical compounds. • Remove multiple coats of slime, biofilm, etc. Handwash Concentrates enable chemical formulators to make and resell their own handwash, with desired characteristics. 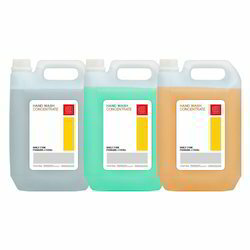 Hand Wash Concentrate product is further diluted with water to make a ready-to-use handwash solution such as Dettol handwash. Handwash is used to wash and clean hands killing germs and microorganisms, more skin friendlier than soaps making it suitable for children even. It protects against everyday germs including those that can cause skin infections, respiratory infections (Influenza), gastroenteritis (such as Salmonella and Escherichia Coli). Pearly Handwash Concentrates enable chemical formulators to make and resell their own handwash, with desired characteristics. Pearly Hand Wash Concentrate product is further diluted with water to make a ready-to-use handwash solution such as Dettol or Lifebuoy handwash. Pearly Handwash is used to wash and clean hands killing germs and microorganisms, more skin friendlier than soaps making it suitable for children even. It protects against everyday germs including those that can cause skin infections, respiratory infections (Influenza), gastroenteritis (such as Salmonella and Escherichia Coli). Air Freshener Concentrates enable chemical formulators to make and resell their own air freshener, with desired characteristics. Air Freshener Concentrate product is further diluted with water to make a ready-to-use air freshener solution. Air Freshener is water based viscous concentrate with desirable fragrances. Dish Wash Concentrates enable chemical formulators to make and resell their own dish wash, with desired characteristics. It is a concentrated product to be further diluted with salt and water to make a ready-to-use dish wash solution. It is highly-foaming mixture of surfactants along with preservatives, fragrances and dyes. Dishwashing Liquids only for formulators mainly comes with vinegar and antibacterial components to increase the degreasing power and to combat with all kinds of bacteria respectively. It helps in degreasing, deodorizing and disinfecting any type of utensils. 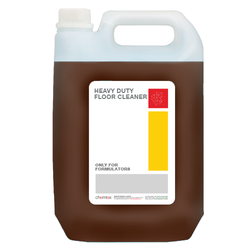 Chemtex’s Floor Cleaner Concentrate is a fully formulated heavy-duty liquid detergent concentrate for cleaning floors in workplace areas of factories, workshops, hotels and restaurants, public areas, office blocks, toilet stalls, service stations and garages. It is safe to use on marble and granite. It does not contain any abrasives or bleach. 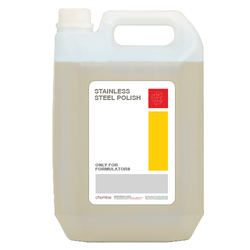 Its unique formulation effectively removes oil grease and dirt from heavily soiled areas. Chemtex’s Bathroom Cleaner Concentrate is a uniquely formulated bathroom cleaner concentrate tolerant to hard water use for cleaning all bathroom surfaces viz., sink, tub, tiles, floor and fittings. It is fresh scented, and does not contain bleach and abrasive chemicals and safe for marbles and granite. It is hard water tolerant and prevents scale deposition. 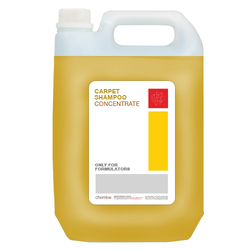 Concentrated carpet shampoo for use in all types of carpet and upholstery. It is a neutral pH, pleasantly scented product for interim cleaning that produces consistent high quality dry foam trapping carpet dust and residues to be easily removed by vacumming, ergo hindering rapid re-soiling. 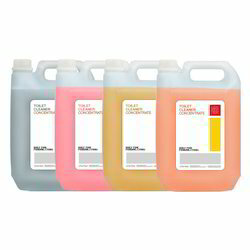 Looking for Housekeeping Chemicals ?